Arcangelo Corelli was one of the most gifted, influential, and popular composers of the baroque, bringing a new level of virtuosity and expression to violin playing. Our next All Angels’ concert brings you into the musical world of this great master via his older Roman compatriots Lelio Colista, Girolamo Frescobaldi, and Alessandro Stradella. 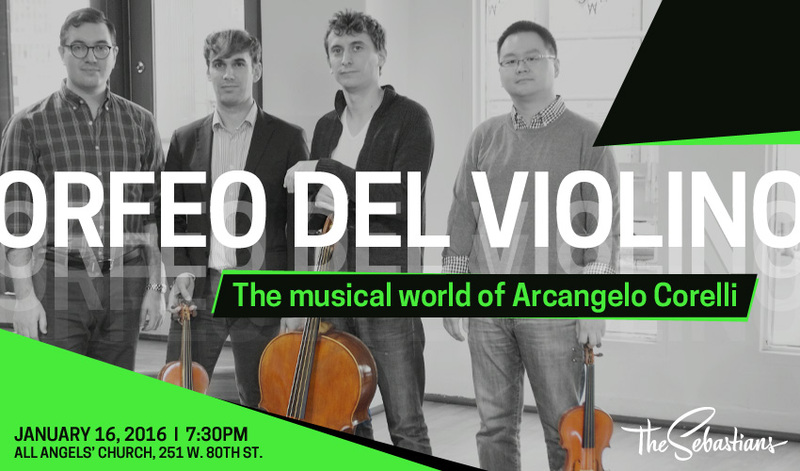 The intimate All Angels’ Church is the perfect venue for the Sebastians core musicians—Daniel S. Lee and Nicholas DiEugenio, violins; Ezra Seltzer, cello; and Jeffrey Grossman, harpsichord—to treat you to a gorgeous renditions of Italian music for two violins, cello, and harpsichord. Don’t miss it! Tickets available at the door after 6pm.